To Cite: Dehghani M, Taatizadeh S B, Samaei M R. Biodegradation of n-Hexadecane in Acinetobacter Radioresistens Liquid Culture, Health Scope. 2013 ; 2(3):162-167. doi: 10.17795/jhealthscope-14262. Background: Diesel oil hydrocarbons are the most common contaminants of our biological environment. Considering the fact that Iran is one of the major producers of diesel oil products, it greatly contributes to soil and water pollution. Currently, soil and water pollutions caused by diesel oil products leakage, from distribution stations, is one of the major concerns in Iran. Based on the studies performed in this regard, soil and water pollutions have also been reported around the refineries and transmission lines in Iran. Objectives: Thus, the present research aimed to study the effectiveness of using Acinetobacter Radioresistens in removing n-Hexadecane (n-HXD) from polluted waters. Materials and Methods: In this research, n-HXD (C16H34) was selected as the representative of diesel oil hydrocarbons. Hence, the bacterium Acinetobacter Radioresistens was chosen to remove this compound from the polluted water. Results: According to the results, the total n-HXD removal rates were 57.2, 87.35, and 91.33 in 10, 20, and 30 days, respectively. The initial concentration was 9615 mg/l. The biological (Acinetobacter Radioresistens) removal rates were 35.51, 49.45, and 51.6%, while the non-biological rates were 21.68, 37.9, and 39.73% in 10, 20, and 30 days, respectively. Conclusions: Our results suggested that in the warm weather and salty soil of Iran, normal n-HXD can be removed from the polluted waters through localized bacterial usage, especially Acinetobacter Radioresistens. Waste removal is one of the most important industrial challenges considering exploration, storage, processing, and transportation processes (1). Leakage and unwanted distribution are two major reasons for pollutions during utility, production, refinery, transportation, and maintenance processes. In addition, oil tankers which carry large amounts of diesel oil products are the major reasons for sea and ocean pollutions (2). Due to the wide use of diesel oil products as raw materials in different industries, diesel oil leakage is a major concern for these industries (3). Diesel oil as an index for total petroleum hydrocarbon (TPHs) is the major biological organic contaminant with toxic, carcinogenic, and mutagenic effects (4). Moreover, these pollutants can be absorbed into the soil or organic particles and, consequently, increase their concentrations and penetrate into surface waters. These contaminants can even penetrate into ground waters and cause some problems to living organisms (5). These organic contaminants have long durability in the soil and can be a risk for humans and animals; therefore, they should be removed from the biological environment. To date, different chemical and physical methods are used in order to remove these contaminants, but some of them are expensive and have side effects (6, 7). Soil and water pollution by diesel oil hydrocarbons is a major concern for the biological environment (8). The concentration of these pollutants in the soil is sometimes low; nonetheless, the total concentration of 450 mg g-1 has been reported in some soils (9, 10). Hydrocarbons consist of hydrogen and carbon atoms, where the number of carbon atoms determines their physical properties (11). Besides, diesel oil is a complicated compound consisting of alkenes and aromatic compounds (12). Among alkenes, those with medium chain size are major soil contaminants. In this class of alkenes, n-HXD was introduced as the model pollutant; rather than diesel oil used by many researchers (10). In fact, n-HXD (CH3(CH2)14CH3, 226.44 g/mole) has been selected because of its low water solubility (0.9 µg/L) (11), as well as fast decomposability by many microorganisms (10). Hexadecane cause dryness, irritation and cracking of skin, and when ingested can be harmful and even be fatal. It also stimulates mucous membranes and upper respiratory system inhalation and even causes pulmonary injury (13, 14). Since n-HXD is used as an indicator of diesel and petroleum compounds, the guideline of these compounds in soil can be applied for n-HXD. Up to now, different physical, thermal, chemical, and biological methods have been proposed for the removal of these contaminants. Biological methods have attracted more attention compared to other methods due to their lower costs as well as environment friendly properties. The wastes obtained from this method consist of water, CO2, and cellular biomasses. Biological filtration usually increases the speed of biodegradation (15). In addition, this method is more consistent compared to chemical and physical methods (16). Therefore, the biological method is an important method for removing soil and water pollutions (17). The efficiency of this method depends on the local microorganisms which decompose diesel oil hydrocarbons (15). Today, many microorganisms have been identified which can decompose diesel oil hydrocarbons (18). In some researches, separated bacteria were used, while microbial agents were used to remove diesel oil compounds in some other studies (19, 20). Hassan Shahian et al. have isolated 25 types of bacteria decomposing diesel oil in Persian Gulf and Caspian see (21). Joseph et al. (1) also isolated microbes decomposing diesel oil in a refinery in India. In that study, a bacillus was isolated from a polluted soil. Besides, Dashti et al. (22) isolated bacteria decomposing n-HXD in soil. The most common bacteria were Micrococcus and Pseudomonas. Iran as one of the major producers of petroleum products greatly contributes to soil and water pollution. Based on the studies performed in this regard, soil and water pollutions were reported around the refinery units. In Fars province, this issue becomes more important because of the large number of refinery units in this region. Since Acinetobacter Radioresistens bacteria can produce significant amounts of biosurfactants and increased the solubility of petroleum compounds, this bacterium was selected for the current study. Therefore, the main purpose of this study was to investigate the removal of n-HXD from polluted water by Acinetobacter Radioresistens. Since diesel oil consists of many compounds, depending on its production method, n-HXD was selected for this study as an alternative. The mineral salt culture media used in this study is presented in Table 1. Table 1. Chemicals Used for Preparing Mineral Salt Media (23). HCl (1 normal), sodium hydroxide (1 normal), and a pH meter (827 pH Lab-Metrohm, Swiss) were used in this study. First, the culture's pH was adjusted at 7. Then, 15 g/L Agar was added to the liquid culture to prepare the solid mineral culture. After 15 minutes of autoclaving in 121°C and cooling the culture inside the plates, 20 µL n-HXD was added to the culture media and shacked in order to be distributed evenly. One clone of the bacteria was taken by a sterile loop, linearly cultured on n-HXD culture, and inserted in the incubator at 37°C for 24 hours. Then, an Erlenmeyer flask was placed in a shaker incubator and shaked at 120 rpm for 24 hours. The optical density (OD) was measured using a spectrophotometer (Dr-5000 HACH, USA) at 600 nm wave length. Afterwards, the capability of Acinetobacter Radioresistens for removing n-HXD from polluted water was measured. For this purpose, 17.75 mL mineral culture and 1 mL micronutrient (5%) was inserted in a 50 mL Erlenmeyer flask. Then, 250 µL (192.3 mg) of the mixture was taken and the opening of Erlenmeyer flask was sealed off using foil and cotton and autoclaved. After that, 250 µL of n-HXD (final concentration of 9615 mg/L) was added to the Erlenmeyer flask. Also, 1 ml of the nutrient culture in which the bacteria were cultured for 24 hours was added to the mixture with an optical density of 600 nm. Control and blank without bacteria inoculation, respectively, were also used to determine non-biological removal. On the other hand, the control samples had no bacteria and 1% NaN3 was added to them to prevent the growth of bacteria. The samples were placed in a shaker incubator at 120 rpm for 30 days. The normal amount of n-HXD was measured in 10, 20, and 30 days to determine the removal percentage by the bacteria (Table 2). Table 2. The Chemicals Used for the Preparation of the Minimal Salt Culture Media (24). The plate count method was used in the nutrient culture in order to study the number of live bacteria during different stages of the biodegradation process. Nutrient agar (28 g) was added to 1 L distilled water to prepare the culture. Then, the culture was autoclaved and poured in plates under sterilized conditions. After cooling, the plates were used for inoculation (25). The number of the bacterial colonies was counted in each stage. For this purpose, different dilutions (10-5, 10-6, and 10-7) were prepared and inoculated on agar nutrient containing plates. After incubating the plates at 37°C for 24 hours, the growth clone was counted using colony count model (Funkijerbe made in Germany). Liquid-liquid extraction was used to extract n-HXD. To the mixture, 10 mL of 99.8% n-hexan was added and shacked for 1 minute at vortex condition to extract n-HXD from the liquid phase. The mixtures were left to rest for 5 minute, and then collected the organic phase volume was separated and passed through Teflon filter (0.22 µm in diameter). Then, with 10 mL of 99.8% n-hexane rinsed and stored in a refrigerator prior to GC analysis. The recovery of n-HXD from liquid phase with this method of extraction was 95% (26). The bacteria Acinetobacter Radioresistens was taken from a previous study (25), where it was obtained from the soil polluted by Abadan refinery and detected using 16S rDNA. All the chemical materials used in this study were purchased from Merck (Germany). Gas chromatography (GC) and FID detector were used to measure the amount of the remaining n-HXD. The temperature of the detector and the injector were set at 250 and 210°C, respectively. Besides, the column's temperature was maintained at 80°C for 1.5 minute and then increased to 125°C for 5 minute. Afterwards, it was increased by 40°C per minute to reach 190°C, which was maintained for 3 min. The chromatogram for the input and output samples are presented in Figure 1. The present study was conducted on the removal of n-HXD by Acinetobacter Radioresistens separated from a soil polluted by diesel oil in Abadan refinery. 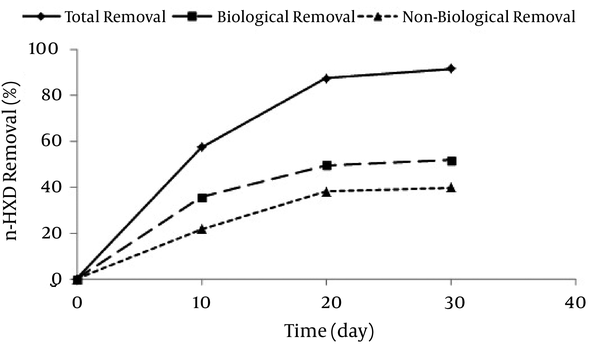 The removal rate of n-HXD by the bacterium during 30 days time interval, is presented in Figure 2. According to Figure 2, the total removal rate in 10, 20, and 30 days were 57.20%, 87.35%, and 91.33%, respectively. During these periods, the biological removal rates were 35.51%, 49.45%, and 51.6%, while the non-biological removal rates were 21.68%, 37.9%, and 39.73%, respectively. The amount of dissolved oxygen, pH, and the number of bacteria were also assessed in this period to investigate the bioreactors’ variations during the biodegradation of n-HXD. The variations of Dissolved Oxygen in different stages are shown in Figure 3. 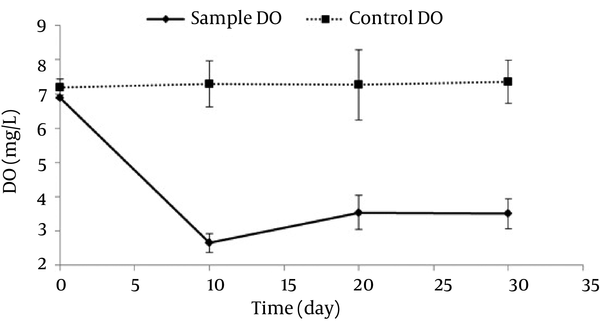 The amount of dissolved oxygen reduced in the first 10 days, then increased in the second 10 days, and finally had a constant trend in the last 10 days (average concentration: 3.5 ± 0.05 mg/L). pH variations are shown in Figure 4. The initial pH rate was adjusted at 7 ± 0.2. However, it decreased to 5.4 after 10 days and finally reached 7 on day 30 with a constant rate. In this study, the optical density index (600 nm) was used to investigate the microbial changes and bacteria growth. The changes of optical density in this 30 day period are presented in Figure 5. According to Figure 5, the bacteria’s growth increased in a fast trend in the first 10 days, then stopped, and increased constantly up to the 30th day. Since the optical density cannot differentiate between alive and dead bacteria, plate counting method was used for days 10, 20, and 30 Figure 6. 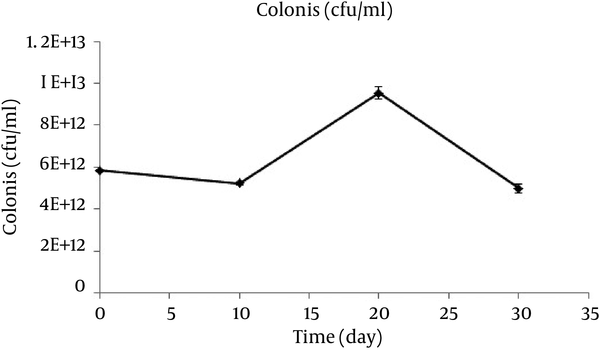 As the Figure 6 depicts, the number of bacteria decreased with a slight slope in the first 10 days, increased with a sharp slope in the second 10 days, and finally decreased with a similar slope. Diesel oil contaminants are the major soil and water pollutants in Iran due to its oil-rich nature. These contaminants have relatively low solubility and bacteria accessibility. As mentioned earlier, the total rate of n-HXD removal after 30 days was 91.33%. Biodegradation rates were 35.51%, 49.45%, and 51.6%, while non-biodegradation rates were 21.68%, 37.9%, and 39.73% in 10, 20, and 30 days, respectively. This removal rate showed a fast trend in the first 10 days and then decreased due to the limited bacteria accessibility. Therefore, it can be concluded that the initial concentration of n-HXD is a limiting factor for the removal rate by Acinetobacter Radioresistens. This result was consistent with the findings of some researchers (27, 28). For instance, Setti et al. (29) used SPP Pseudomonas to remove n-alkenes from diesel oil. Their results suggested that the removal rate increased along the decrease in the molecular weight of the aliphatic compounds and decreased along with an increase in the number of carbons atoms. For example, C35 removal rate was 52.55% after 31 days. The initial concentration of 12 g/L of diesel oil was used in this research and a total of 5 samples (28°C, 200 rpm in shaker) were studied. Three samples were studied on the 15 th day and 2 samples were examined on the 31st day and the n-HXD removal rates were 10% and 75.4%, respectively. In addition, Welki et al. (30) obtained a removal rate of 38% after 15 days. As mentioned earlier, the dissolved oxygen rate showed a decreasing trend at first followed by an increasing trend and finally a constant trend; which is in agreement with the study by Monica Michaelsen et al. (31). Our results further suggested that the removal rate was stronger in the first 10 days. Therefore, as the dissolved oxygen rate decreased, the n-HXD removal rate decreased, as well. Considering the fact that a large amount of n-HXD was removed in the first 10 days, DO had a decreasing trend. Afterwards, by decreasing the amount of n-HXD, the biodegradation also decreased and led to an increase in DO, reaching a balance. Considering the DO between the 10 th and the 30 th days which was between 2.25 and 4.03, it can be stated that the reactors were not aerobic and the conditions were sometimes anoxic. In this condition, nitrate acts as the final electron receptor which reduces the velocity of degradation. Therefore, the oxidation rate can be increased by continuous artificial oxygen generation and consequently it can lead to a decrease in the time required for decomposition of n-HXD. One of the effective variables in cellular metabolism and enzymes performance is pH (25). The changes in the arrangement of hydrocarbons led to chemical changes and consequently pH changes (32). 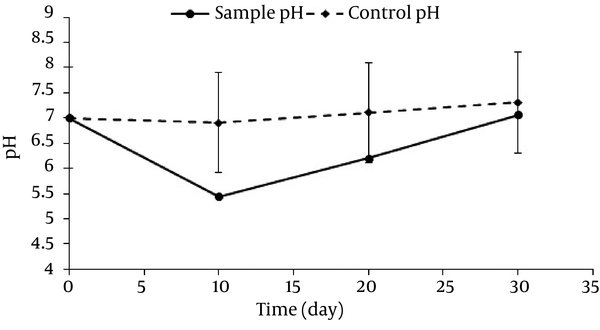 According to the researches (32, 33), the total trend of pH changes is more intensive in the first 10 days, which suggests the effect of low pH values on n-HXD removal. This is in line with our study results, since pH changes were observed in both biological and non-biological samples. It can be concluded that pH is drops due to the microbial activities performed during n-HXD removal. In fact, a large amount of n-HXD was removed in the first 10 days in which pH showed a decreasing trend. The Addition of microorganisms to the biodegradation processes for organic contaminants degradation reinforces the removal mechanism (32). 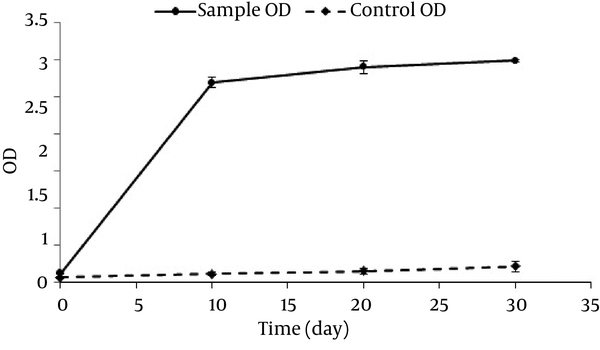 Figure 4 shows the rate of optical density (OD) of the sample containing Acinetobacter Radioresistens, which increased in a sharp slope in the first 10 days and then increased slightly up to day 30. As the OD increased, normal n-HXD removal increased, which is in line with Adebusore et al study. (34) Considering the fact that a large amount of n-HXD was removed in the first 10 days followed by a slighter trend, it can be concluded that OD increases with the increase in the n-HXD removal rate and bacterial growth. On the other hand, by decreasing the n-HXD which is the only existing carbon resource, the microbial activity and OD rate decrease, as well. This suggests a linear relationship between the removal efficiency, OD rate, and bacterial activity. In this study, aerobic bacteria which had a high growth rate were used as Acinetobacter Radioresistens. These bacteria were used to biodegrade n-HXD in liquid environment and revealed to have a high capability to produce biosurfactant and endure low-oxygen (anoxic) conditions (25). In conclusion, our results suggested that n-HXD could be removed in optimal conditions (pH, DO, and OD). Also, Acinetobacter Radioresistens can be used to reduce diesel oil concentration in the polluted water. The authors appreciate the Research Vice-chancellor of Shiraz University of Medical Sciences for financially supporting the research (proposal No. 91-6334). They are also grateful for Ms. A. Keivanshekouh at the Research Improvement Center of Shiraz University of Medical Sciences for improving the use of English in the manuscript. Implication for health policy/practice/research/medical education: In this paper, the removal of hexadecane as an index of petroleum compounds has been studied by the Acinetobacter radioresistensis. Authors’ contributions: The overall implementation of this study including design, experiments, data analysis, and manuscript preparation were the results of the corresponding author's efforts. All authors have made extensive contribution into the review and finalization of this manuscript. All authors have read and approved the final manuscript. Funding/Support: This study has been supported by Vice-chancellor of Shiraz University of Medical Sciences. 33. Verstraete W, Van R, Loocke R, Borger A, Verlinde JM. Biodegradation and Biodeteriation Modelling of the breakdown and mobilization of hydrocarbons in unsaturated soil layers. Kingston, RI. Appl Sci Publ London.